Our estate vineyard was originally planted in 1896. For a frame of reference - In 1896 there were only 44 US states, Henry Ford invented the first automobile and the first modern Olympics took place in Athens… These days Guy follows business on his smart phone while working in the vineyard. 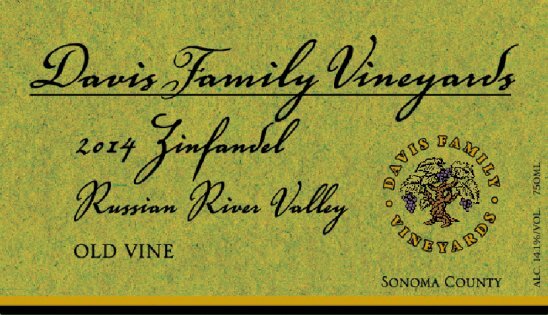 When the Davis Family acquired the property in 1995, the vineyard had been abandoned for nearly 20 years. It took just three years (and a lot of hard work) to get the ancient vines to produce fruit again- 70 cases in 1998! That being said, these vines may have returned to form, but that doesn’t mean that they don’t still perform on their own schedule. We make several passes from individual vine to vine picking through the 2.8 acres during the harvest season. This meticulous process is used to ensure that every single berry and cluster are at the perfect point of ripeness. The old vine crest on our label pays tribute to the old vines that started it all, born out of our passion to create this special wine.